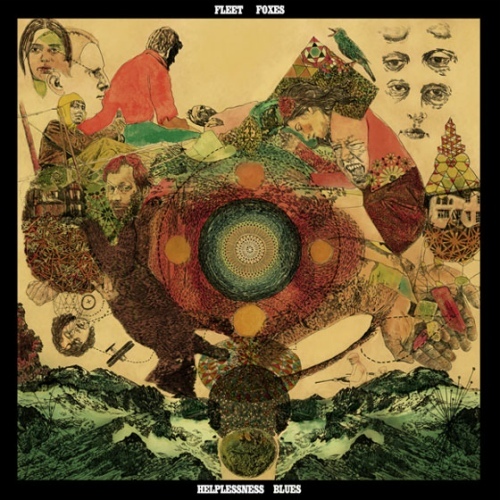 When Fleet Foxes’ 2008 debut full-length won accolades from all corners of the music world, the Seattle-based band managed to field mainstream media bear hugs without alienating their original fans. The group, centered around wunderkind singer-songwriter Robin Pecknold, pulls this off by displaying ample amounts of old school folk know-how, employing rich vocal harmonies and simple but compelling acoustic arrangements that still bear faint traces of their off-kilter, indie-folk roots. Pecknold is a notorious perfectionist, and a serious case of sophomore album jitters reportedly plagued him as he labored over final mixes of this album, which almost went through another round of revisions before his bandmates urged him to let go and move on. Whether it was because of this extra fussing or not is unclear, but Helplessness Blues is a stellar effort that lives up to the expectations created by the debut. While it remains true to the pastoral melodicism established on previous recordings, and favors a similarly reverb-drenched production, Pecknold’s compositions seem a tad more adventurous this time around. Ethereal layered vocals still dominate the arrangements, but the band is subtly expanding its sonic horizons, both in their choice of instrumentation (the Foxes are not afraid to bust out glockenspiels and zithers here) and in their artful veering away from straight-ahead folk sounds. For example, the sweeping album-opener “Montezuma,” which showcases Pecknold’s lithe falsetto, recalls the swooning beauty of township jive and doo-wop, while not sounding like a conscious pastiche of either, and “The Cascades,” an instrumental, explores florid Flamenco-flavored guitar without sounding jarring next to the other tracks. The jubilant, piano-laced “Bedouin Dress” combines uplifting surf harmonies and a free-wheeling, unmoored melody reminiscent of Astral Weeks-era Van Morrison; appropriately, the lyrics repeatedly mention Innisfree, a reference to an earlier mystical Irish bard, Yeats. The exotic “Sim Sala Bim” covers a lot of ground in just over three minutes; straddling English and Middle Eastern folk, the song, presumably about a missing lover, bursts into a rousing acoustic rave-up, bookended by quiet passages that come as a rare spacious reprieve in the otherwise relentlessly dense record. “The Shrine/An Argument” begins in hushed reverence, as spooky and exhilarating as music at a Catholic high mass, and shifts midway into a more rambunctious rhythm but no less gothic melody. “Kenzie Battery” makes dramatic use of symphonic percussion, a lumbering gait, and a sunny, Brian Wilson-ish vocal turn, and “Lorelai” is a dizzy, exuberant waltz. Despite these detours, this is a folk record, and the Foxes still dole out the brand of super-retro, ‘60s-inspired numbers they’ve become famous for, such as “The Plains/Bitter Dancer,” “Someone You’d Admire,” and “Blue Spotted Tail.” The latter is practically an out-and-out homage to Simon & Garfunkel, as is, to a lesser extent, the transcendently pretty title track. The words are as woodsy and quaint as ever. Pecknold seems to take his inspiration from classic British poetry, and rarely refers to objects, characters, or events that would place him in the 21st century, relying instead on imagery like old stone fountains, seeds, keys, sand, and the night sky. The young songwriter seems preoccupied with loss and looming mortality here (“Why is life made only for to end?”), and some of the songs convey the sheepishness and scrambling for identity that sometimes accompany early success. “Montezuma,” primarily a meditation on death, begins with an apologetic line about being older than his parents now than when they first started having children. Similarly, the title track expresses the wish to be a useful cog in a greater machine rather than a special and ineffectual singular entity. The soul-searching continues on other tracks, but the mediating splendor of the music transforms that potential self-absorption into the realm of hymns. Still in his mid-twenties, and only at the two-album mark, Pecknold has established himself as a big talent; it will be fascinating to see where he and his co-conspirators go from here.